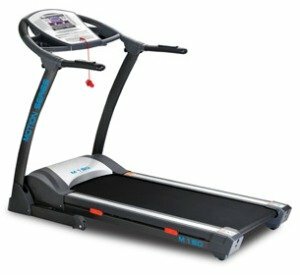 At $799, the TruPace M150 treadmill is the top model from 1800treadmill.com, an innovative new marketing idea in the US that offers decent treadmills at phenomenally low prices. The console has three small LED windows for speed, distance/time/calories, and pulse. The main window has a blue backlit LCD display that shows a graphic display of your program progress. 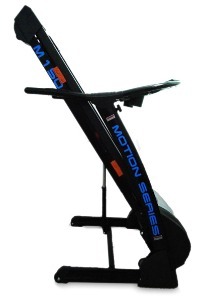 There are quick select buttons for the 14 programs as well as 15 levels of power incline. 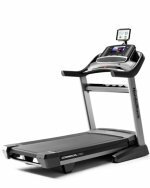 The TruPace M150 treadmill offers a strong and durable 2.5 continuous duty hp motor, a 20" x 55" walking surface, 8-point shock absorption cushioning, 2" rollers, and a gas-assist lifting mechanism on the deck for the folding frame. Other features include a handy water bottle holder, handrail buttons, and a max user weight of 350 lbs. The 14 programs include manual, a Body Fat Test, and 12 speed and incline control workouts. The integrated heart rate monitor helps to keep you in the proper training zone, while the iPod and MP3 compatible TruSound Audio System with two speakers will help to pass the time while you workout to your favorite music. Along with the excellent lifetime coverage on the treadmill motor, TruPace Fitness offers a decent warranty on the M150 with 2 years coverage on parts and 1-year on labor. Should you want to go with an extended manufacturer’s warranty, it costs $79.99 for one year (parts and labor), $99.99 for 2 years, $139.99 for 3 years, and $179.99 for 4 years. The TruPace M150 treadmill has more features than the middle model, the M120, but that doesn’t mean more is better. We suggest you check out the specs on the M120, which is the best value in the TruPace line. It has a different console layout but the same solid 210-lb frame, as well as the same size rollers, cushioning, deck length, and 2.5 chp motor. Read the reviews and compare them, and we think you’ll agree that the M120 is a better deal than the M150.